EU27 countries have been experiencing a continuous fall in their production capacities. This trend has been exarcabated since 2006 when the productions suddenly started closing . The premium denim wave of 2005 had just peaked and the mills started to find it difficult to maintain their productions at the costs which could be only justified by the usage in premium denim jeans. While there were a large number of mills in Italy , Spain and some other countries in EU, now only a handful remains. And the production has sunk – giving way to Asian mills. a)Table showing actual productions of denim fabrics in EU 27 countries in the period 2005-2011.
b) Chart showing the trendline of this productions and how productions reduced to 1/3rd levels in 2011 as compared to 2005.
c) Chart showing the average value of these productions declared by the mills. These are given on an annual basis. This also gives an idea of EU declared production costs per sq mtr. 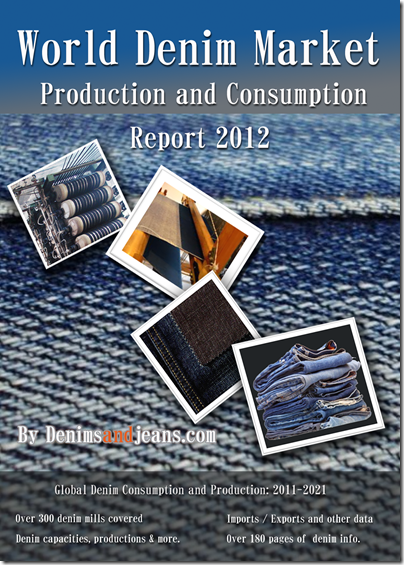 Also check out our latest report – a compendium- on world denim industry – click on image.